SpaceX test fires a previously flown Falcon 9 rocket booster ahead of its planned launch on June 19, 2017 to send BulgariaSat-1, the first communications satellite for Bulgaria, into orbit from Pad 39A of NASA's Kennedy Space Center in Cape Canaveral, Florida. Update for 10:30 p.m. ET: SpaceX has delayed the Falcon 9 rocket launch of BulgariaSat-1 to no earlier than June 23 to allow time to replace a suspect valve on the booster's payload fairing. Read our full story. Original story: SpaceX is ramping up for its eighth flight of the year on Monday (June 19) with the launch of a communications satellite for Bulgaria aboard a previously flown Falcon 9 booster. It will be the second demonstration by Elon Musk's space company of its ability to reuse its launch-rocket hardware. For now, Musk's team is focused on getting BulgariaSat-1, Bulgaria's first satellite, into orbit. The spacecraft, manufactured by Palo Alto, California-based Space Systems Loral (SSL), will be used for direct-to-home television and communications services to the Balkans and other regions in Europe, as well as North Africa. Satellite operator Bulgaria Sat is a sister company of Bulsatcom, a television, internet and mobile communications company based in Sofia, Bulgaria, that employs about 2,000 people. "Back in 2010-2011, we started seeing a need to develop the services we were providing," chief executive Maxim Zayakov told Space.com. "The satellite operator we were using at that time was not able to provide any growth opportunities … We were going to have to move somewhere or create our own home. It was kind of like, “Why move three times? Why not create our own home? We were already holding a license for Bulgarian orbital slots, so why not? This is the best we could do to do the ultimate quantum leap." To finance the deal, which is costing about $250 million, Bulgaria Sat turned to the Export-Import Bank of the United States, an independent government agency that provides U.S. businesses, including SSL, with government-backed loans so foreign customers can buy their products. BulgariaSat-1, the first communications satellite for Bulgaria, undergoes testing with its solar arrays deployed. The Export-Import Bank has been a target of conservatives in Congress and remains mired in political controversies, though President Donald Trump said in April he plans to revive the hobbled agency. "We have to pay tribute to the U.S. guys who were able to support this program because, frankly speaking, it was going to be totally impossible without their support. Space is not like anything else," Zayakov said. "The programs have a very long horizon. It's not something in the usual telecom world. The commercial banks would usually not support something that would have a horizon of more than five years and that is by far not the case in space." Bulgaria Sat hired SpaceX on its own in 2007 for a Falcon 9 rocket ride, but the deal later was folded into the SSL contract, which handles manufacturing, launch services, insurance and the first year of satellite operations. Terms of the deal were not released. Bulgaria Sat, in partnership with SSL, opted last summer to switch to a previously flown Falcon first stage in exchange for an undisclosed discount and earlier launch slot. The Falcon 9 rocket that will launch BulgariaSat-1 flew in January 2017 to send a batch of 10 Iridium communication satellites into orbit from Vandenberg Air Force Base in California. The booster landed itself on a drone barge in the Pacific Ocean. SpaceX relaunched its first recovered booster on March 30 on a satellite-delivery mission for Luxembourg-based SES. "The booster provides a good value and at the same time we have full confidence in its performance," Zayakov said. "There was a byproduct that we got a bit earlier launch date too." 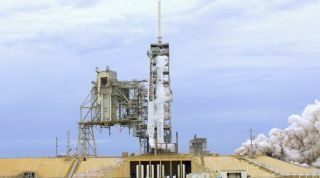 SpaceX President Gwynne Shotwell estimates that Bulgaria Sat was able to fly about three months sooner by opting for the preflown Falcon. Once operational, BulgariaSat-1 is expected to generate between $24 million and $25 million annually, Zayakov said. The satellite, which weighs nearly 8,800 lbs. (4,000 kilograms) is designed to last at least 15 years. Bulgaria Sat services nearly 1 million homes with direct television and other communications services. With the new spacecraft, Bulgaria Sat is aiming to double that figure over the next five years, Zayakov said. Editor's Note:You can watch SpaceX's Falcon 9 launch of BulgariaSat-1 live via SpaceX's webcast page, which will begin Monday about 1:46 p.m. EDT (1746 GMT). You can also watch the launch webcast here, courtesy of SpaceX. Irene Klotz can be reached on Twitter at @free_space. Follow us @Spacedotcom, Facebook and Google+. Original article on Space.com.